Really enjoyed much of the book — many of the Jedi lessons are great fun and with the trade-mark Gidwitz caring for a young person’s mind and character. The second person narrative device worked for me and the added extended training segments made me happy. The third person narrative parts about Han & Leia are faithful to the movie but to someone like me who saw the original movie and re-watched it a few times in the past few decades, they can seem a bit bland. I could tell that the imagined audience is actually those who’re young and not exactly familiar with Episode V. Waiting to hear from my 4th & 5th graders of their view. The story about a chubby 5th grade boy who is grappling with being the unathletic one in the class is told with a very light and gentle touch: he’s never so troubled by it to be sad, his best friends (who are all fast runners) are all supportive, his teachers do not put him down, even when they try to help him build up his stamina. And his relationship with his parents is loving, albeit full of little conflicts due to his very active mind that is constantly wondering about the world around him and coming up with out-of-the-box ideas. This is the first of the Rainbow Crow set of high quality contemporary children’s books from China (by the 21st Century publishing company) that I have read and I am definitely impressed: by the author’s understanding of young people’s mindset, by the excellence of the production/design value, and by the publisher’s insistence of offering current stories by Chinese authors to young readers. 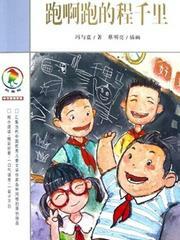 Colorful Ravens* “Original Stories in Chinese”* series of 20 titles were published in 2012. I obtained four copies and will report on all of them as soon as I finish each. To read the bilingual plot summary that I made for this book please head over to the Goodreads page. *My translations for the series names were different from the publisher’s. Corrected on 8/18/2015.